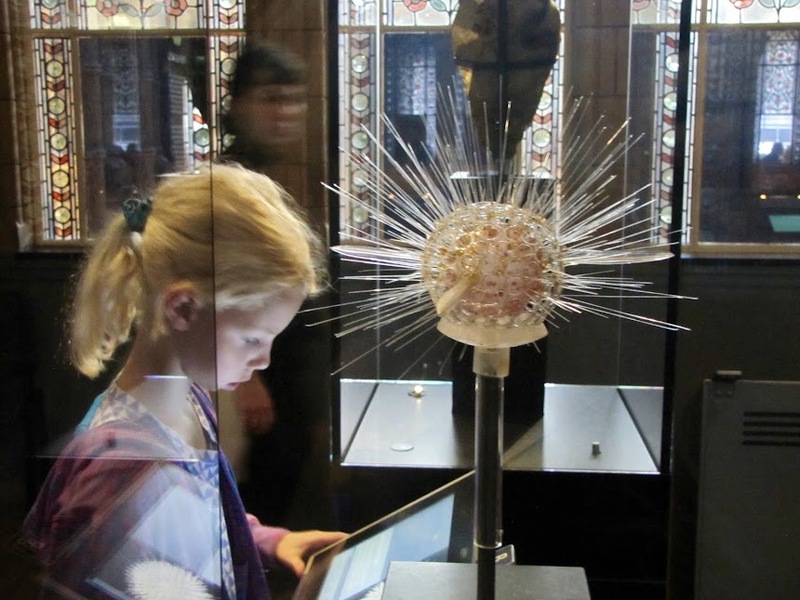 “Don’t touch,” say the museum signs. “Don’t touch.” I’ve run across a few interesting signs on my travels mostly prohibiting something. I am one of those people who try to be careful and follow the rules. Not always, but mostly. I pay attention to signs. A trip to the Civil Rights Museum in Greensboro gave a new meaning to using signs to intimidate and enforce rules. The original Greensboro Woolworth lunch counter was integrated by four young black college kids in the early 1960’s. The counter is the centerpiece of the museum. There are a multitude of “White’s Only” or “Colored Only” signs. In one display there is a double-sided Coca Cola machine from the Greensboro train station. The two sides faced different rooms. The side of the Coca Cola machine in the "White’s Only" waiting room read “5 cents” and the sign on the machine in the "Colored Only" waiting room read “10 cents”. This seemingly ordinary signage carried vindictively discriminatory qualities. I was appalled. Back in Rock Island, Indiana there was this sign in a park. I don’t skate or lets say I haven’t skated in years and years, but I caught myself noting the message. The sign doesn’t really pertain to me. I won’t forget the rule allowing swamp skating. I wonder how many prohibitions, like this one, that we needlessly keep stored in our brains in some “just in case” file. A faded STOP sign is something that I have never seen before. The sign bespoke of the condition of the neighborhood. A bright red sign would have been out-of-place in this derelict place. 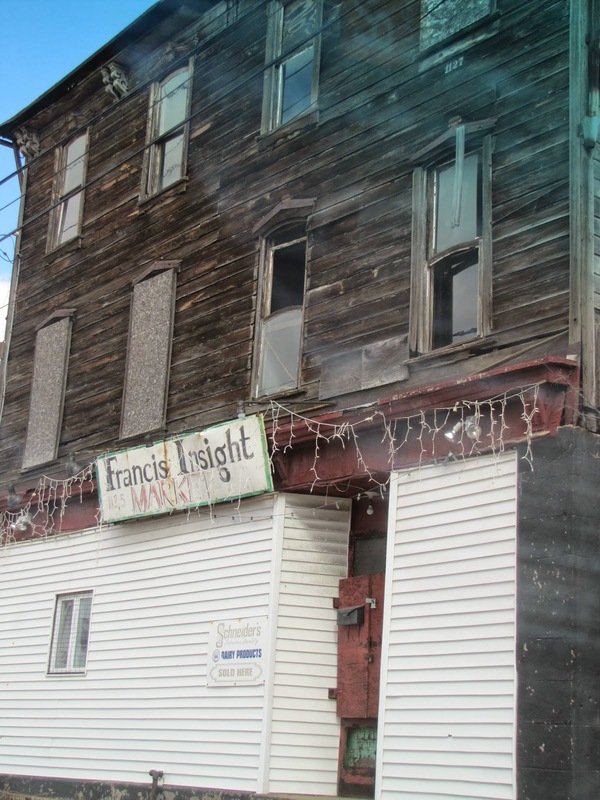 The neighborhood of McKeesport, Pennsylvania had been in decline for many years. These photos show what the neighborhood of that faded stop sign looks like today. The one vibrant store within a few blocks of the faded STOP sign seemed to maintain its hold on business by using this noteworthy “guy” to advertise it’s shop. 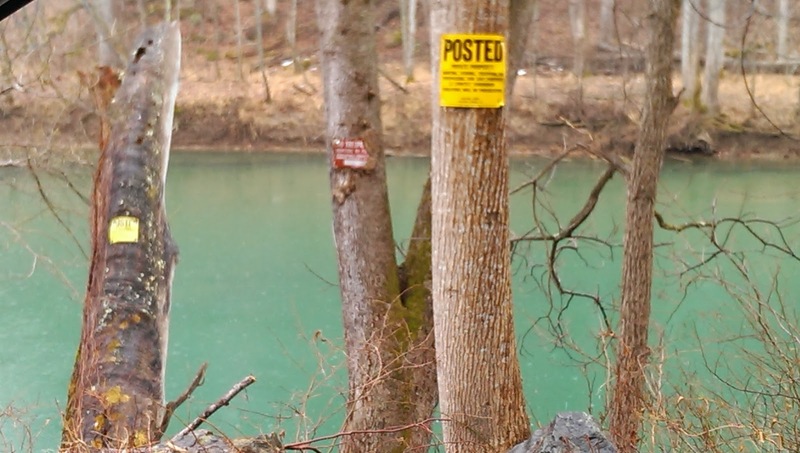 The Maury River in Virginia had an unusual number of signs about trespassing. The river has a “come on and have a dip” shade of welcome that seemed contrary to the forbidding signs. I’m curious about the stories behind the need to post so many signs. Did the human who posted the signs just have a wealth of them and found the array of colors pleasing or was there really a threat that folks would slide down the steep bank and do something wildly inappropriate. As I ease into tobacco country with the tall tobacco drying sheds like this one, I also began seeing advertising on barns. I was taking a shortcut in West Virginia, when I got lost. 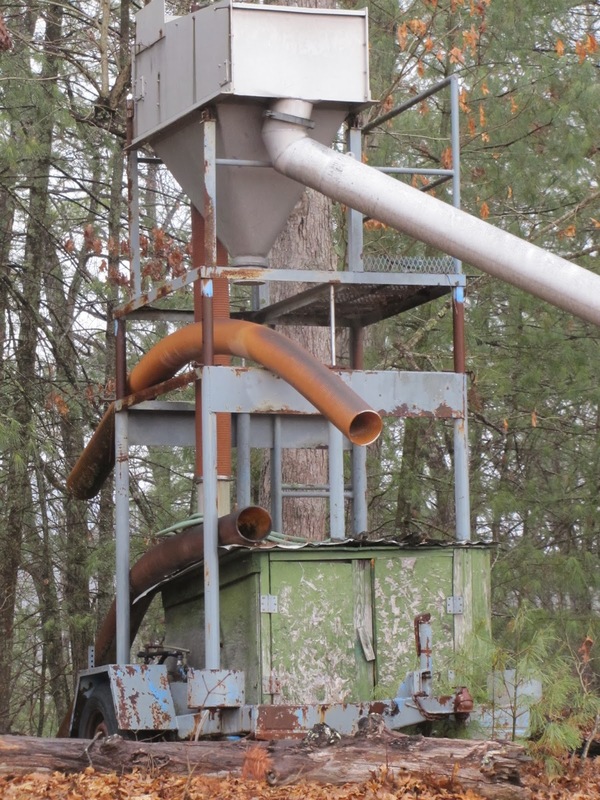 I passed an interesting machine, but I didn't stop to take a photo until the road ran out and turned to gravel. Retracing my route I passed the machine again. Help me. What sign should be on this machine? What is it? It's a "still". Still there after time and usefulness. Still - quiet. Still waiting. Good guess. A certain possibility.